I love this ring! and they are sold out!! I visited Modcloth through my brother-in-law Fiance's blog and fell in love with it! They have the cutest vintage style clothes and accessories. I love this Coat.....and my birthday is in 3 weeks...hint, hint! 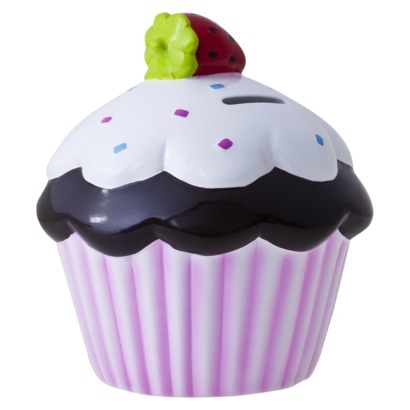 This is my cupcake piggy bank I bought at target, while in New Jersey. We don't have a Target in Vermont or any good shopping at all (unless you want some maple syrup!) so when I'm near a populated area I try to hit up all the shopping I can! I hope everyone has a great Sunday......I'm off to dye my hair and bake some cupcakes!